This morning I went up Green Mountain via the Greenman trail with the intention of doing Bear Peak if things felt alright. The temps were still cool but warming quickly as I left the trailhead in Gregory Canyon at 8:50. I was pretty slow on the ascent taking about an hour but this was OK as it meant I had plenty of energy for the Green Bear trail and the Bear Peak West Ridge. Surprisingly nobody was at the summit of Bear when I arrived at 10:45. I had a relatively quick jog over to South Boulder Peak and back to Bear and I head back down the West Ridge at 11:15. By the time I rejoined the Green Bear trail I was definitely tiring and made it up to the West Ridge on Green by noon, the last two hundred yards being a total death slog. I headed back down the Ranger Trail to Gregory Canyon, getting to the car at 12:40 completely fried. I will look up the miles and elevation gain later but this route has to be one of the best local runs around with stellar views, terrain, and lots of climbing. I would say that coming back on the Mesa Trail is not my first option now, even with the hot plod up Green Bear. Thinking about Longs again this week, maybe Chasm View? Yesterday I left Boulder at 8:30 and headed up to Estes Park and the East Longs Peak Trailhead. About an hour later, I arrived there and after a few preparations and a chat with the trailhead RMNP volunteer started heading up. I have not been at altitude since some forays to Chaos Canyon last year so I wanted to get above 11,000 feet. A quick run up to Chasm Junction (7 miles out and back, 9400-11,500') or thereabouts seemed a good plan and great preparation for doing the whole Keyhole route. The altitude definitely kept me from putting on much speed and as the trail is relatively low angle, I certainly felt like I was plodding, a feeling that lasted until I encountered some hikers and saw more clearly the difference in pace. It was really nice to clear the treeline and soak in the tremendous ambience that Longs offers. Extraordinarily wet conditions have really fostered the alpine wildflowers which are everywhere. The soaring snow gullies and jagged ridges have a genuine alpine feel and the mist that periodically swept across the face of Diamond reminded me how serious this place can be. I saw that the snow was now clearly retreating on the section to the Boulderfield, making a run to the Keyhole a next likely destination if for no other reason than to immerse myself in the atmosphere of clear light and tremendous space that this part of the mountains offers. The run back down was speedy and uneventful (approximately 2 hours out-and-back time) and I felt pretty good overall and ready for another excursion. I was back in Boulder at 1:30 to give Sophia lunch. Wednesday's run up Green Mountain was good preparation for yesterday's and I plan to keep building on it. It is too bad that parking near the trailhead after the Keyhole route is opened for hiking is so difficult. That is the number one hassle I foresee in trying a run/speed ascent. Here is the video of Shadowline, a problem just right of Hagans Wall. For full credit, you finish up on the crux of The Ramp Traverse, a very reachy and somewhat bold problem than I find about as hard as Hagan's or the Consideration, sometimes harder. I got up really early this morning to hit Flagstaff before the temps warmed up and found myself at Cloudshadow after a short warm-up on the slabs at Nooks Rock. I wanted to get started by doing a problem I did a few weeks earlier before my elbow got wonky, Shadowline, a very thin and crimpy V9 right of Hagans Wall. I eventually want to link this into the regular traverse and then go into the Undercling Traverse. After a little bit of time checking out the holds I was surprised to do it first try so I then checked out a problem a bit west on Rear End Rock called Tongue in Cheek, V9. I did this for the first time last year and it took many many tries and at least 4 days. After a bit of work and maybe 4 tries, I did this problem as well. The last problem I wanted to try was the L to R traverse of the Red Wall into the Red Wall Regular Route which is probably easy V9. After an initial try to the last move, I did it on the next one, though barely. A great short session and some light at the end of the tunnel for the elbow? As a relatively new father myself, Father's Day has an entirely new meaning and given me a new appreciation for what my father has given me. If you're a dad and you're still climbing (and of course even if you're not) congratulations! And if you have (or had) a father, take a moment to consider what that relationship is all about (even if it hasn't been easy) and give thanks for all you have experienced in this world. Here's a video of Tongue in Cheek, Shadowline to follow. This morning I embarked on a run up in the foothills, planning on a simple trip up Flagstaff and over to Green Mountain. I felt pretty week on the first part of Flag, especially at the start but for whatever reason started getting into a rhythm that kept me going to the top of Green. I decided to head down to Bear Canyon and think about Bear Peak and since running down this part felt OK, I headed up the Bear Peak West Ridge Trail. This is always a slog so I kept it very slow and reached the summit in decent shape. This is important since the hard part is next, heading back down Fern Canyon and the Mesa Trail, especially if you didn't quite bring enough water or food. Next time, two Clif Bars! I made it back to the car, got home and drank about half a gallon of water. I have done this run only once before and consider it one of the great hikes/runs in the area. The weather was surprisingly crisp most of the way and the views from the three summits were spectacular. I am aiming to get in shape for some higher elevation excursions soon once the snow retreats from the high peaks a little more. Moving fast across high terrain has a magical appeal of its own. For a local blogger with some extensive experience at this, go here. If any readers have recommendation for runs in RMNP or the Indian Peaks let me know. This morning I went up to Flagstaff and after warming up did three problems in the V7/8 range pretty easily. It was a little warm but reasonably dry so a nice session overall. I am trying to explore the limits of my strength while not aggravating anything which is a delicate balancing act indeed. In addition to easier problems, I have been trying the low start to an old problem called That Flakes It Direct and finding it quite difficult. The grade feels like solid V10 and I would like to know the beta from the FA. A recent post from the Climbing Narc has highlighted the imminent completion of a new gym in Boulder which I plan on visiting soon and posting some pictures here. About two years ago I made a conscious decision to climb indoors as little as possible, including CATS where I climbed almost nonstop for many years before, a decision that has reaped some benefits in terms of maintaining a fresh attitude about training and progress. Although it is true that nothing will get you stronger than an indoor gym/wall, there are pitfalls as well, which I am learning, or re-learning. 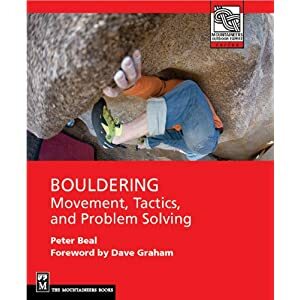 For those interested in the nitty-gritty of the physical mechanics of training, I am recommending a book called One Move Too Many which specifically lays out what happens physiologically while climbing and makes some very valuable suggestions for avoiding and healing injuries. If you are not aware of just how complex, versatile, and effective your arms, hands, and fingers in fact are, this book will enlighten you. The book is not cheap but well worth it, though the picture of the severed thumb (page 45) is a bit much. I hope to present some thoughts on the contemporary literature out there on training and would love to hear from readers about which books, websites, etc they find helpful and why. I am still pretty tired from a session on Sunday where I ran from the mouth of Gregory Canyon up the Flagstaff trail and began bouldering from Nook's Rock on up to the First Overhang Ridge before heading back down. 35 problems from VB to V6, 1.75 miles, and 750 feet elevation gain. Oddly this is the same elevation difference from Bear Lake to Lower Chaos. I am still working on my elbow issues and my theory is that rapid ascents of easy problems help to loosen things up a bit. We shall see whether this works or not. The big news in local bouldering is the 4th ascent of Jade by the unstoppable Nalle H who managed the problem in just two days and with very unpromising conditions both weather-wise and in terms of the approach. You can get a great description and photos at his blog. This ascent has started the Park season off with a bang. It will be interesting to see who else climbs this world-class problem this season. Interesting to note two fairly critical articles in the new Deadpoint Mag Online, one about sponsored climbers and their tenuous relationship to reality and the other about the new bland face of competition climbing. The first piece is too vague and general in nature but is a start in seriously discussing what "sponsored" and "professional" really mean these days. Abbey Smith in the latter piece makes some good points about the problems with professionalizing climbing comps but I doubt much will change on this front as noted in posts elsewhere by me. For example in the local paper there was absolutely zero about the World Cup event in Vail. The Denver Post has a good write-up here. Anyway it's good to see a more feisty journalistic stance coming from the new kid on the block and makes me hopeful for the future though they really need a good copy editor! Make sure to read this short article at Planet Mountain about the new reality of climbing. Is anything really interesting in climbing news anymore? What constitutes innovation and a unique contribution? Is harder climbing just becoming more of the same old same old? Finally Joe Kinder posted this link to a great video of Adam Ondra in the Czech Republic. The slow-mo warm-up sequence is readily skipped but the last third is extraordinarily good as it illuminates Ondra's spidery yet powerful climbing style, similar to Dave Graham's. Be sure to watch full-screen HD. This June has seen some remarkably changeable weather. The sky is constantly shifting as clouds mass over the foothills and empty onto the plains. The sun breaks through with shafts of gleaming light picking out ridges and valley, moving with silent and unbelievable swiftness over the land below. Nothing stays the same for too long and even as Boulder Valley glows an intense emerald green, there is the certainty that the heat of July and August will turn this joyous riot of foliage yellow and brown as summer reaches its height. It's a great time to be a painter and watch the rapidly changing light and color and try to find ways to capture some of the essence of this movement and its beauty. Yet there is also the sober reminder at its heart that nothing exists forever. There is a Latin phrase, from Vergil's Eclogue IX (thanks Google), Omnia fert aetas, animum quoque, meaning "The ages carry everything away, even memory itself." I am reminded not just of recent tragedes such as the deaths of Johnny Copp, Micah Dash, and Wade Johnson but of a recent item that surfaced in UKClimbing.com about the demise of some "crucial" holds on a 14a route known as Mecca. The reaction from many was shock and dismay followed by proposals to "restore" the route to its former condition. A curious but understandable response from climbers, to want to hold something in place that once was. There is another great sentence, this time from Leonardo da Vinci, who studied the ways in which erosion shaped the world. Dimmi se mai fu fatta alcuna cosa, which reads, "Tell me if anything was ever finished." In this world nothing is, a thought that inspires both wonder and despair. The stormy skies over Boulder seemed to echo the mood of many locals as word emerged of the likely fates of two local legends Micah Dash and Johnny Copp. The two plus a cameraman Wade Johnson were on an expedition in China when they did not come back for their flight home. So far the body of Johnny Copp has been identified. The full scoop can be found here and here. No doubt more information will emerge as Chinese and American teams explore the likely accident site near Minya Konka. Nobody really needs reminding of how dangerous tall mountains are but events such as this bring this reality back in focus to a community for whom this environment is a second home. Climbing is a dangerous sport and sooner or later someone you know will be killed or seriously injured doing it. All you can do is remind yourself and others to be as careful as you can to keep the odds in your favor. Speaking of pushing the envelope, Alex Honnold, with partner Sean Leary, redpointed the Salathe Wall in 8.5 hours. I am ambivalent about speed climbing on a lot of levels and this ascent is no exception as the only real way to cut free climbing time substantially is essentially to solo long sections of the climb by simul-climbing with little protection. Alex is the only climber I know of who has the ability to climb at that level without a rope way up there on a big wall as his solo of Half Dome made clear. However the margin for error on climbs done in this style is exceptionally thin and the consequences of failure correspondingly drastic. His reply to the question of soloing Freerider was refreshingly candid but the fact that the question keeps coming up in climbing media is kind of scary. Lastly an interesting question of ethics emerged in the case of a repeat of all things) of a Markus Bock boulder problem rated Fr8c (V15) in the Frankenjura. You can get the drift of the discussion at 8a.nu and Bjorn Pohl's blog. Periodically this emerges as an issue and then drifts away again. Interestingly, Markus Bock's route Corona was just repeated by Adam Ondra and rated soft for 15a. As for me I am considering how best to deal with a case of lateral epicondylitis, "tennis elbow" that emerged over the last few weeks. This is something I have never had before and relatively rare for climbers compared with medial epicondylitis, tendinitis on the inside of the elbow. If you are wondering why I am not discussing my climbing wall yet, it is that I am not yet ready to absolve it (and myself of course) of guilt for my present condition. I can still run (I did Green Mountain on Friday, my 45th birthday) , and paint, and periodically update this blog. This definitely spoils some plans I had for summer bouldering however. Only time will tell. Oh yeah there were the Teva Games as well. Congratulations to Alex Puccio on her win! Alex Johnson took second and Daniel Woods second for men. A German, Jonas Baumann, won the men's competition. There's a great article in the Times today about the winner of the 2008 Olympics Decathalon winner Bryan Clay that should give pause to any aspiring "professional" climbers out there. The story relates how Clay, who by definition is the best all-around athlete in the world, lives a life of near-anonymity with his wife and two children, still sponsored as an athlete but hardly at the level worthy of a real champion. Speaking of anonymity, I am crawling out from under a sinus infection that left me literally lying under a rock at Flagstaff yesterday unwilling to get up and climb. Hopefully it will begin to subside soon. I had a good session on Saturday doing 25 problems from V0 to V6 in a couple of hours. I started by running up from Gregory Canyon and then picking off problems as I went along before running back down to Gregory Canyon. It can be very liberating climbing without a crashpad but you have to be careful.